It all started as a joke. Sitting around the breakfast table on the morning of Finn’s one month “birthday”, I jokingly said to my husband, “So what stuffed animal should we use in Finn’s one month photo shoot? What outfit should he wear?” I know that it’s all the rage to buy those monthly milestone stickers and find a cute stuffie and a big chair in which to take photos of your baby each month, but Finn is the third child. I didn’t make it past 4 months with Max, my second, and didn’t even plan to attempt this time around. We take lots of pictures day to day, so the memories will be made. 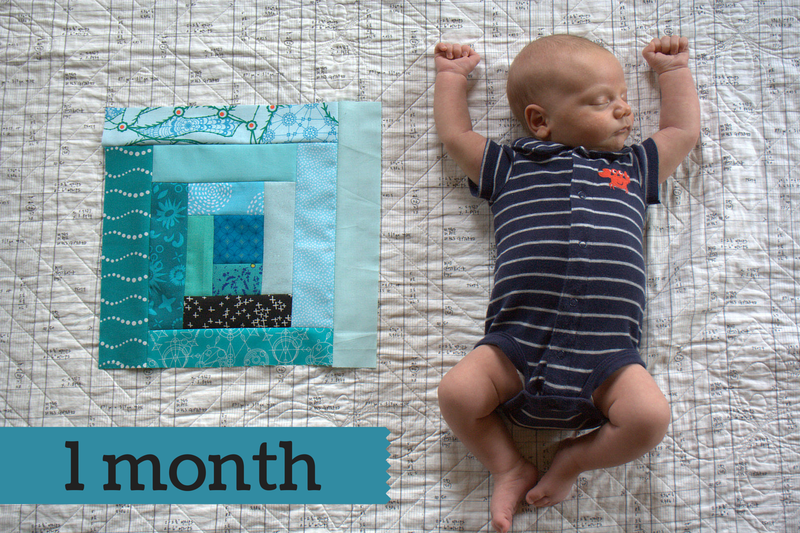 My husband, joking right back, said, “Didn’t you whip up a quilt block for his one month photos?” But instead of laughing and enjoying a mutual “poor third child” joke, I gaped. What a great idea! Now this idea of a quilt block per month was stuck in my head. How long could it really take to sew up a quick simple block? There was no turning back. Recently, I’ve been thinking a lot about the importance of making time to sew, and how a simple 20 minutes per day can add up to progress. I decided to put this to the test, set a timer for 20 minutes, and use whatever block resulted from my timer sewing endeavor. I opted for a simple log cabin block, inspired by the recent log cabin blocks made by Kim at My Go-Go Life and the epic log cabin quilts made by Luke Haynes. It was also the perfect choice since I could use scraps and just sew whatever strips fit without too much thought. Ta da! The project was a slam dunk (get it? Finn is slam dunking… kind of?). I had to pause the 20 minute timer once for a baby nursing break, and I ultimately decided to hit snooze and sew for 30 minutes, since I had the opportunity, but it worked! Making the goal to sit down and sew for 20 minutes got me at my machine and resulted in a 12+” block. My friends Stephanie at Late Night Quilter and Mandy at Mandalei Quilts and I are going to try out a goal of sewing (or making other sewing-related progress) at least 20 minutes each day. We are all busy moms with full plates, but setting a small, attainable goal will help us make sewing progress, too, without stress. We will be sure to post about our experiences on our blogs as well as on Instagram using hashtag #sewtake20. 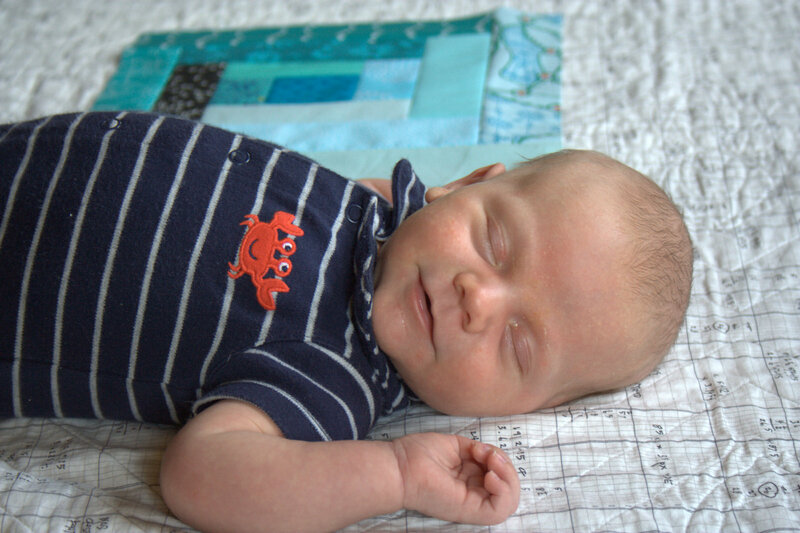 My first #sewtake20 trial run was a success and resulted in a great start to a new project, documenting how a quilt can grow along with my baby with only 20 minutes per month. They are both getting soooo big! I’m linking up with Freshly Pieced’s Work in Progress Wednesday, and will be posting more about my #sewtake20 progress on Instagram. If you feel like you need a little boost to get sewing daily, feel free to set a timer for yourself. Tag #sewtake20 so that Stephanie, Mandy, and I can see your progress and cheer you on! That’s a great idea! If you can do it with a newborn, I think I can do it with a 5 year old. Going to have to try this one… once I’m back from vacation and have access to my sewing room. he is absolutely adorable!! and I love the idea of a monthly block for photos!! Lovely baby and block–in that order! I love it, this is a brilliant idea. 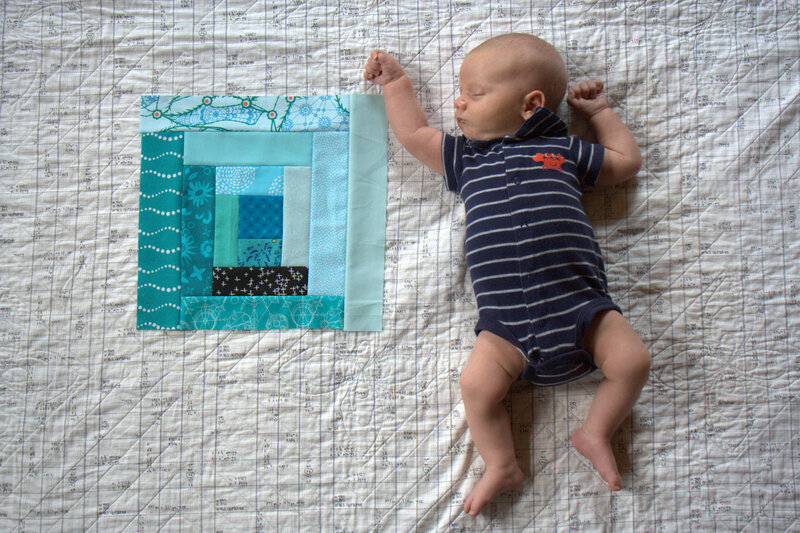 Beautiful quilt block and baby too. What a great idea. Great block and a very cute Finn. What a great idea and a great block in such a short amount of time. I see a smile on Baby Finn’s face; he likes it too. And 12 blocks at the end of a year; perfect for a one-year-old quilt. LOL, Kitty, it does look like a slam dunk. Finn is beyond adorable! It looks like he’s playing the “So Big” game in his last photo. A great idea to make the blocks like that! Those pictures are really adorable. Great block as well! Ahhhh! Adorable baby!! 🙂 I LOVE the quilt block a month idea. What a neat quilt that will be. Isn’t is just great when the hubsters come up with the best ideas! I’m so happy that mine is even involved in quilt layout decisions! I am very lucky that I have some time carved out in my mornings to actually get some sewing done, but I am so easily distracted, that it might be a good idea for me to be very specific about my focus. 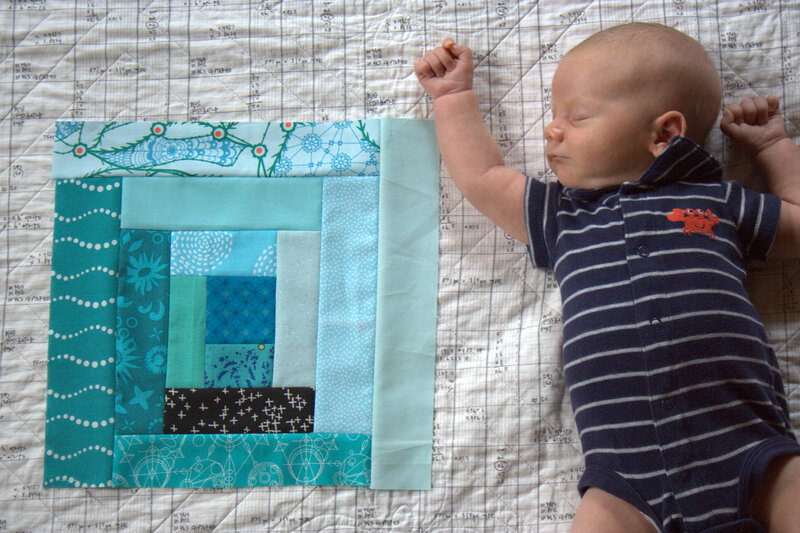 This will be a fun progression of blog posts featuring baby getting bigger along side a growing quilt. What a fabulous idea!! Or should I say that your idea is a Slam Dunk?! Your baby has a BOM. That is hilarious. Another awesome idea I wish I’d thought of. Honestly. I’ll be continuing to wish that as I wrangle DT for their 8 month pic on Monday! Wouldn’t it be cool to put all the blocks together in the end as Finn’s quilt? A creative time for you and a way to track Finn’s months ahead – good idea! It was a pleasure to meet both of you this weekend. I look forward to strolling through your archives and clicking on your links to other quilters. What a great idea! I hope to get inspired and try it out myself. And your boy is so cute! Lovely pics!